Woohoo, today my blog ‘Natural Beauty And Makeup’ (NBAM) turns 1 and truly no words can describe my happiness! On this first blog anniversary, I would like to convey my heartfelt gratitude to each one of you. Without your immense support, my blogging journey would not have been so much interesting and blissful! It is due to this baby, I got that chance to meet with some of the talented bloggers and amazing readers which otherwise would never ever have been possible. Keep showering your love and wishes on my baby ‘NBAM’ always my sweethearts. 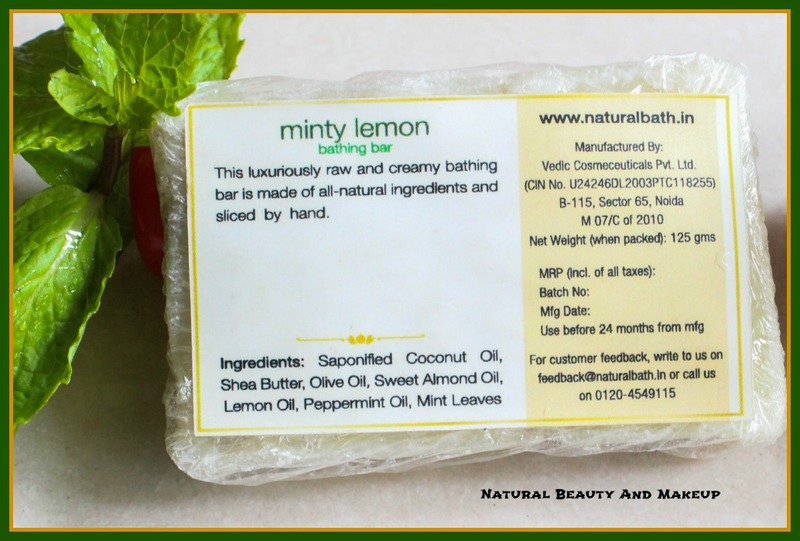 This luxurious raw and creamy bathing bar is made of all-natural ingredients and sliced by hand. 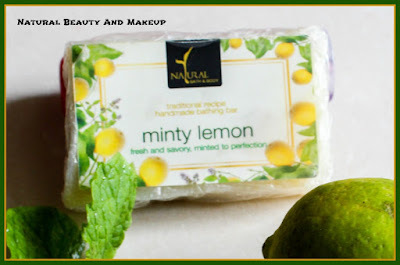 The mélange of shea butter and oils of olive, sweet almond, coconut, and lemon has exceptional moisturizing properties that maintain the skin’s delicate balance, while the fresh mint leaves soothe the senses. Shelf life: Use before 24 months from Mfg. 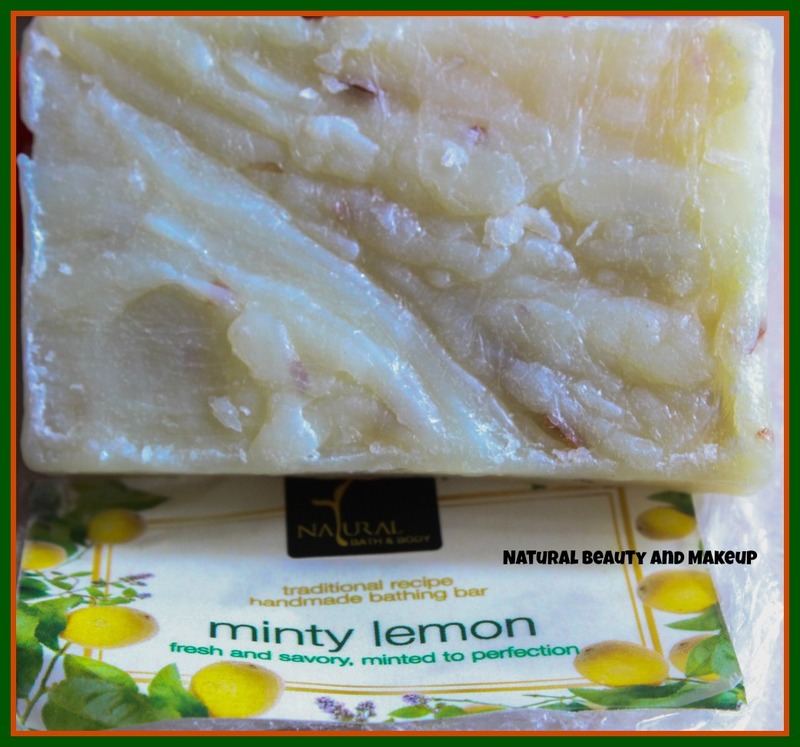 Ingredients: Saponified Coconut Oil, Coconut Oil, Shea Butter,Olive Oil, Sweet Almond Oil, Lemon Oil, Peppermint Oil, Mint Leaves. As you can see in the picture, the soap came to me nicely wrapped with a transparent plastic. This kind of packaging might be because it is just a small sample which I received along with other sample products in my O MY BAG subscription box. 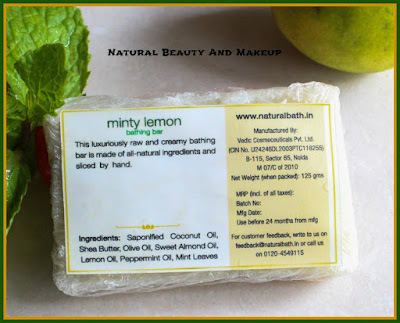 The packaging also contains two stickers, on the front sticker, the brand and soap name is featured whereas rest details are listed on the back sticker. Overall, the entire packaging reflects lemon and minty vibe. Coming to the texture, this soap is soft to touch and is off-white in color. 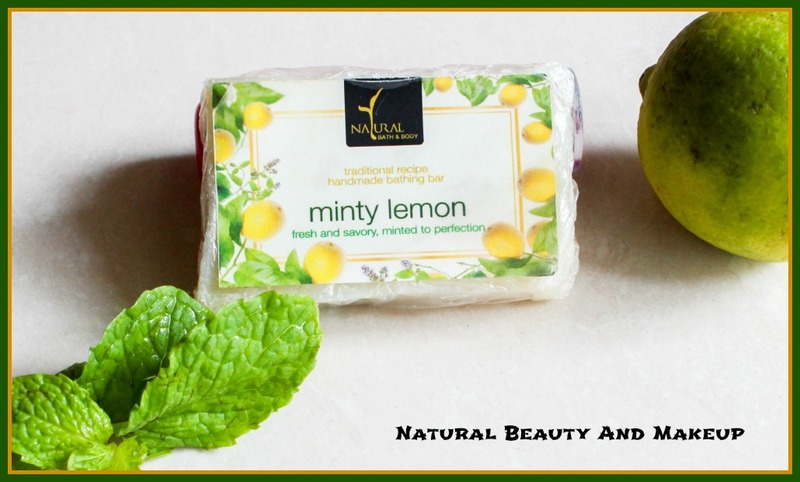 There are few brown colored herbs which are engraved in the soap, most probably dry mint leaves. 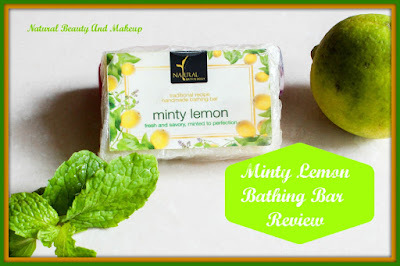 It releases a decent smell but not at all close to mint or lemon! Nevertheless, the fragrance is mild and goes away soon after wash. This is the first time I am using any handmade bathing bar. I was really excited when I received this soap in my subscription bag. For the last few weeks, I have been using this soap and I must admit that I am quite impressed with it. 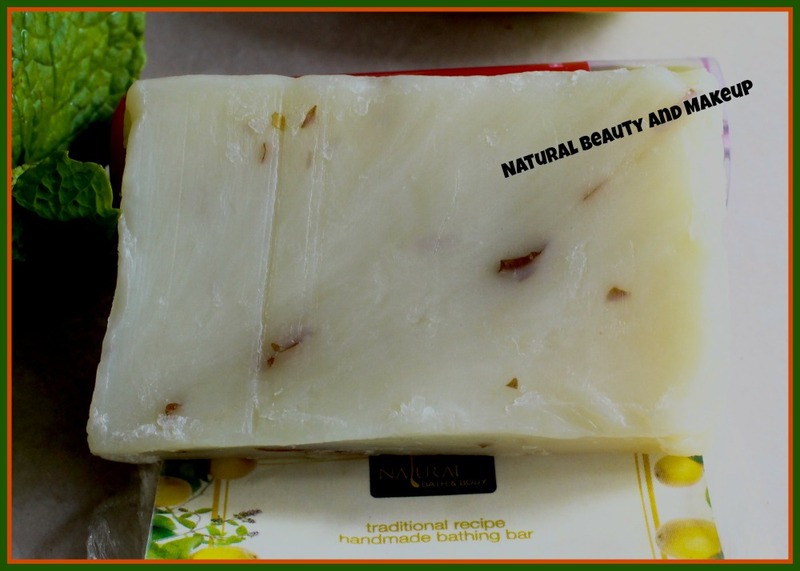 The presence of shea butter and oils make it a very gentle moisturizing soap for the skin. In spite of being a handmade natural soap, it produces decent lather and cleanses the body so well leaving my skin feeling super clean and refreshed. It removes effectively all the dirt, sweat and impurities without leaving any soapy residue on the body. I hate the fact when even after washing my body thousand times those stubborn slippery soapy residues remain on the body. In this case, it gets easily washed away, a huge plus. The texture of this soap is soft but not slippery. It doesn’t dry out my skin that much, though I apply my body lotion after bath. But, what I feel is, this is not appropriate for super dry skin people especially in winters. I have started indulging myself into using handmade soaps lately and found this Natural Bath & Body Minty Lemon Bathing Bar extremely good. I am just a bit disappointed with the fragrance of it otherwise, I do feel everyone must give this soap a try at least. Highly recommended. Have You Tried Natural Bath & Body Minty Lemon Bathing Bar Ever? If Yes, Then Do Share Your Experience With Me In The Comment Section Below. Thanks a lot, Lisa <3 :) Yes Lisa, I was expecting it to be lemony or minty perfumed soap but alas!! The fragrance seems a bit disappointing. But other than that, it looks to be a great handmade soap. Absolutely Mia! I feel so good using all natural products, it calms my mind :) <3 thanks. Congratulations dear and long way to go. Congratulations Anamika for first anniverssary of NBAM. Minty and refreshing.. seems like it has all the perfect things you need for in a cleanser. Monty lemon is something I love, but such a pity, it's not available online :( Nevertheless, this is a great soap I believe, with natural ingredients! Hope you have a very nice week! Monty lemon fragrance is my favorite for hotter months...I wish it was available online easily.. Seems so refreshing. Happy blog anniversary. Nicely reviewed.